Has your dentist recommended getting a crown placed on one or more of your teeth? We’ve compiled a list of helpful information so you can stay informed about your treatment. The crown placement procedure is fairly simple, taking only two short appointments. Once you have decided to receive a crown, it is a good idea to consider a teeth whitening treatment beforehand. This is because your crown will be matched to your existing teeth and cannot be whitened in future. If you think you may whiten your teeth at some point, we recommend having a treatment beforehand so we can match your new crown to your preferred colour. Once you are ready to receive your crown, your tooth may need to be prepared. Preparing a tooth involves shaving down the tooth using a small drill called a burr. This will prevent the crown looking bulky next to your natural teeth. The amount of preparation will depend on the level of damage and the size of your natural teeth. 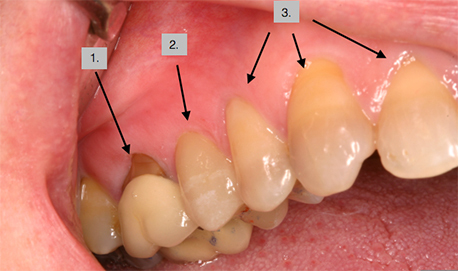 After preparation, a mould is taken of your arch in order to create a perfectly sized crown. This will be sent away to our laboratory. While you wait for this to be created we will fit you with a temporary crown to provide protection and reduce aesthetic disruption. Once your crown has been created, you will come in for a short appointment for it to be placed. We will bond the crown to your tooth and polish it to resemble a natural tooth. 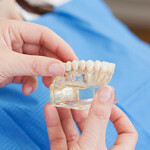 Why do dental crowns cost so much? 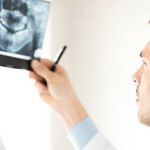 Dental crowns can be an expensive experience, particularly when patients need more than one. It’s important to understand why this is the case, the following reasons are some of the main contributing factors. At Dr Mark Dennes, we place crowns on damaged, discoloured, chipped and weakened teeth to restore the function and aesthetics of our patient’s smiles. If your teeth are damaged, have had a series of fillings or are highly discoloured, crowns may be an option for you. Contact the team at Dr Mark Dennes today. Welcome to Dr Mark Dennes’ media centre. Find out about the latest practice news, information on the treatments we offer and any industry changes that could benefit you.